Introducing their edited collection of work on Michael Haneke, Brian Price and John David Rhodes describe the director as “one of the most innovative filmmakers of this or any other moment of film history” (p. 8). This type of declaration, common to many auteur-centric publications, is unusual in that such reverence seems, on this occasion, entirely justified. While it is his later work that’s achieved the greatest level of recognition (outside of Europe)—particularly his remake of Funny Games (2007) and the Palme d’Or winning The White Ribbon (2009)—Michael Haneke has been creating provocative films for over two decades. Renowned for his detached depictions of violence, and the still, contemplative gaze of his camera, Haneke’s work is underlined by an acute philosophical consciousness. It may be tempting then, as Price and Rhodes acknowledge early within the publication, to ‘explain’ the political or traumatic undertones within Haneke’s cinema through recourse to the place and time of his birth: Austria, 1942. Without discounting altogether the influence of WWII, the authors declare that such a frame offers a “rather convenient [and] possibly overdetermined context” for such cinematic meditations (p. 1). This open critical framework, eschewing the traditional biographical approach common to earlier auteurist studies, is largely mirrored throughout the subsequent writing. Comprised of fourteen scholarly essays, On Michael Haneke is divided into three inter-related sections, each defined by a general analytical or discursive focus. The first section, ‘Violence and Play’ explores the representations of physical suffering within Haneke’s films, paying particular attention to formal techniques, the positioning of the audience, the role of affect and the reflexive nature of the director’s violent imagery. Not surprisingly, given the centrality of torture within the narrative, both Funny Games (1997) and its remake feature prominently in the analysis here. Taking his cues from Elaine Scarry and Theodor Adorno, Brian Price traces the way Haneke’s presentation of torture ‘dismantles’ various structures (of meaning, power etc.) associated with the act, and suggests that its repetition in his work implies an ongoing negotiation with contemporary politics: “What matters here is what [Haneke’s films] all share: the recurrent presence of torture and a historical trajectory that clearly articulates the stakes of torture today” (p. 47). The implications of Haneke’s violent representations are also explored in both Brigitte Peucker and Tarja Laine’s contributions. Analysing the doubled performances within Code Unknown (2000) Peucker notes how the film works to “promote confusion between the diegetic reality of the film and a performance within it”, a strategy that results in “the spectator’s uncertainty about the status of the image” (p. 16). This reflexive characteristic of Haneke’s work, which Peucker articulates through an astute comparison to Michael Powell’s Peeping Tom (UK 1960), is also central to Laine’s analysis of Funny Games. Illustrating the audience’s shifting identification with torturer/victim, Laine argues convincingly that, “Haneke’s game with the audience is to make them share the Schrobers’ agony, while permitting them to move between the diegesis and non-diegesis together with the psychopathic killers” (p. 57). The section concludes with an excellent analysis by Michael Lawrence on the significance of animals within the director’s work. Exploring the on-screen incidents of actual animal death (in contrast with the frequent off-camera suffering of humans), Lawrence argues that Haneke’s films work to complicate the authenticity that is traditionally tied to imagery of violence. “In its death, the film animal paradoxically figures the destruction of the difference (the distance) between reality and the representation of reality” (p. 67). By virtue of this mirroring between human/animal suffering, Lawrence concludes that Haneke’s films problematise distinctions between simulated violence and its real world referents. Issues surrounding the (re)presentation of reality are carried through in the publication’s second part, ‘Style and Medium’, which focuses upon the various formal and stylistic characteristics of the director’s films. Drawing on the work of André Bazin, John David Rhodes suggests that Haneke’s use of the long take places an emphasis not “on the production of an encounter with reality but rather on an obtuse distension of the mediated image of reality” (p. 93). Using examples from Code Unknown and Caché (2000), Rhodes demonstrates how Haneke’s long takes function to provoke narrative ambiguity and beyond that, “a sceptical engagement with value’s infatuation with the image, and our infatuation with assigning value to images” (p. 100). Carrying on from Rhodes, Hugh S. Manon analyses the long take opening of Caché, a shot that as he contends, reproduces the view of the camera as desubjectified gaze. In a psychoanalytic reading Manon examines the film’s visual construction (with its absent/unknown videographer) as an allegorical rendering of Lacanian desire, and the “unfathomable question” of what the Other/other wants (p. 113). Likewise, Fatima Naqvi and Christopher Koné investigate the theme of voyeurism within The Piano Teacher (2001) through notions of the gaze, the image (Barthes, Metz), and an exploration of the film’s sexual symbolism (in objects such as the key and keyhole). 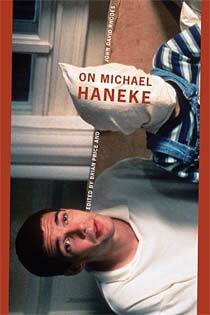 The subsequent contributions in this section approach Haneke’s stylistic traits in a wider industrial frame. Mattias Frey examines Haneke’s filmmaking through its intersection with the director’s theoretical writing, focusing on issues of form and his use of film and digital media. Signalling the transition from Benny’s Video (1992) to Caché, Frey surmises that the, “change of medium produces an altered philosophical basis for Haneke’s cinema” (p. 161). Meghan Sutherland’s contribution considers the status of the television (as technological object, and in its relationship to death) in a predominantly Heideggerian context through films such as The Seventh Continent (1989), while Bert Rebhandl provides an analytical overview of Haneke’s early (and not readily available) television work. Describing the material as an “experimental laboratory of a dialectics of language and images that evolve in his cinema”, (p. 204) Rebhandl reveals a consistency in Haneke’s formal and philosophical preoccupations across both mediums. The final section, ‘Culture and Conflict’ focuses attention upon the socio-political implications arising from and within Haneke’s oeuvre. Christopher Sharrett’s analysis of cultural forms and conflict within the director’s work (ie. classical music, high/low art divide) leads him to conclude, somewhat prophetically, that Haneke’s films depict “a civilisation that grinds all culture into submission, awaiting the demands of corporate capital and patriarchal civilization” (p. 219). Scott Durham similarly traces a cultural critique within Haneke’s films, by exploring whether the director’s formal tendencies (‘serial realism’) offer the possibility of “reimagining [a] postmodern sociality” (p. 245). The question he raises about Funny Games, where the parodic critique of the media risks becoming “as readily consumable as the objects of Haneke’s original critique” is a particularly pertinent one (p. 249). By contrast, Rosalind Galt explores Haneke in the geopolitical context of European filmmaking, traditions that the author convincingly argues, foreclose the possibility of alternative “subjects, forms, political and aesthetic formations” outside those already entrenched cultural identifications (p. 239). Patrick Cowley concludes the collection with a reading of Caché in relation to the killing of Algerian protesters by police in Paris on October 17 1961. Here, as in Haneke’s other work, the personal and the political are seen to be caught in an ambivalent relationship: “questions remain suspended, raised but not answered, preserved and negated” (p. 276). Putting aside the occasional overlap between essays, the quality and scope of analysis undertaken within this collection is impressive. A valuable addition to the growing canon of writing on Haneke this volume should appeal to both students and scholars in cinema/television studies and critical theory more broadly. Perhaps the only major drawback to On Michael Haneke is that The White Ribbon, his most recent release at the time of writing, couldn’t be considered for inclusion. That said, with no less than six volumes dedicated to the director’s work published within the past twelve months, any future film from this most innovative and provocative of directors is unlikely to pass unnoticed.